For some time, I had been contemplating the production of a small daily reading book. I felt 365 entries were unreasonable but thought I could write thirty inspirational pieces, one for each day of the month. I would call it Joy Day, as in, What day is today? Joy Day. Each day, Monday, Tuesday, Wednesday, has the potential to bring us great joy. A year or so ago, I started this project and wrote a handful of entries. 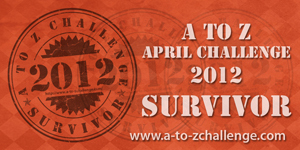 The A to Z Blogging Challenge provided the structure and motivation to complete this. With only twenty-six letters and thirty days, I decided to use four other letter combinations with unique sounds (CH, PH, SH, and TH) to round out my blog. And it worked! Using the theme, Attributes of a Good Life, I was motivated to keep at it. An added benefit was the joy it brought each morning, as I contemplated my daily attribute. Plus, having hundreds of viewers enjoy, comment, and like my writing just added more connection and meaning to both my day and the process of writing this blog. Will daily blogging remain a habit? Based on my activity since May 1, I guess not. Am I more comfortable with the technical logistics? Definitely. Was I thrilled to see I had visitors from ten different countries? Absolutely. Was I proud that I reached my personal goal for all-time views? You betcha. Do I now believe in the power of the internet to bring people together from every part of the globe? Yup. Thank you, Challenge organizers, for pulling this together. I’m a better blogger for it and I’ve now got my completed Attributes of a Good Life! Feel free to stop by my website to see what else I’m writing! And I hope today is a Joy Day! just finding you through the A-Z challenge. I’d like to revisit you and read your A-Z posts. The theme is wonderful. Nice to have found you! What a treat you are! What an excellent idea to turn it into a book. A Joy Day book sounds wonderful. Thanks for sharing. Great to see you got something out of the Challenge. Last year, I came up with a series idea. It’s currently waiting for me to go through and clean it up. One project at a time. That’s all we can do: one project at a time! Thanks for stopping by. Congratulation on finishing the challenge. I didn’t visit all blogs during the challenge but, cross my heart, I’m visiting every single one with reflection post! Thank you for sharing your thoughts. Visiting from the Post A-Z Road Trip…I’m determined to visit everyone who signed up! Congratulations on completing the challenge! Seems you won all around. It’s good and certainly encouraging for the hosts that you got so much out of it. Nice post. Thanks for sharing.